in Search Marketing with tags Google, Google Showcase Ads, Product Listing Ads, search advertising, Search Marketing Both comments and trackbacks are closed. 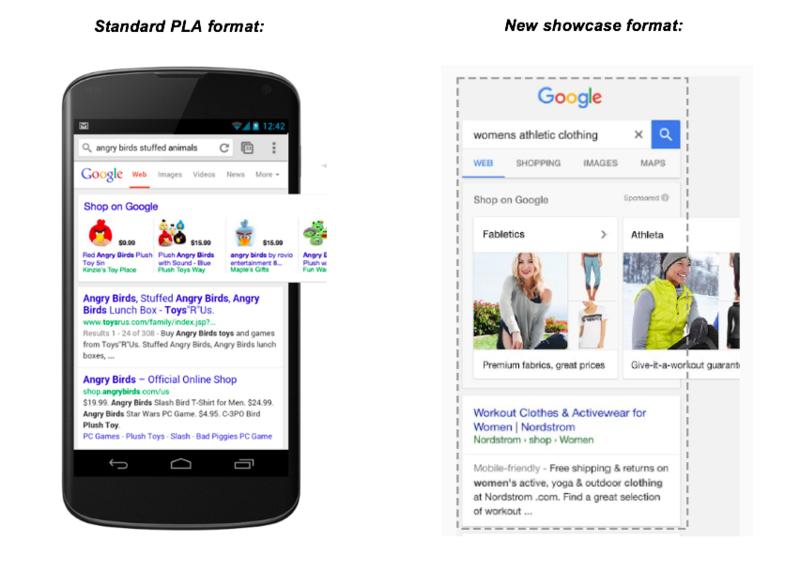 In a recent announcement, Google unveiled showcase ads, a new product listing ad (PLA) format which will go live on select mobile inventory traffic in Q3. Building off of Google’s other extension opportunities like seller ratings and merchant promotion, showcase ads will offer a more immersive ad experience that will both enrich the search engine results page (SERP) and give retailers more options when it comes to creative messaging, content curation, and optimization. In this post, we will outline the key features of showcase ads and takeaways for marketers. 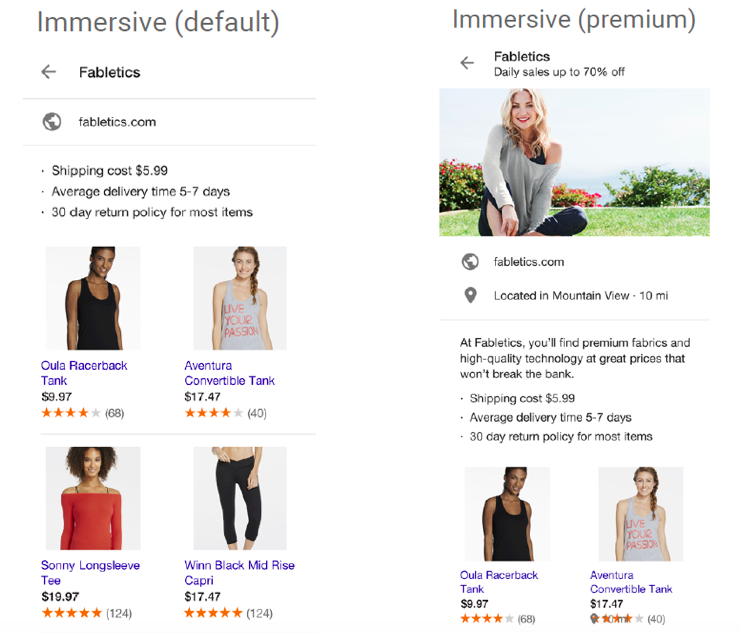 Default: Should a retailer take no action, Google will automatically generate a full-screen card containing related items from the feed and general information about the retailer. Premium: Under this format, tentatively carrying a cost per engagement (CPE) pricing model, retailers will be able to supply images, ad copy, and a list of items to showcase. They’ll also be able to supply a category page URL, which will be displayed below the lifestyle image. Leading retailers have been working feverishly in recent years to build their online brands and differentiate their digital storefronts. They’ve made substantial investments to streamline navigation and checkout, bolstered their fulfillment capabilities, and experimented with value-adds such as live chat. But these investments haven’t always been easy initiatives for digital marketing teams to highlight. PLAs in particular often present a dilemma. While they typically perform well from a profitability standpoint, their simplistic format doesn’t provide retailers much room to form an online identity. Given only the ability to show a product and a price, how can retailers promote the digital brand they’ve worked so hard to build? Showcase ads present a potential solution by bringing PLAs into conceptual alignment with larger digital marketing initiatives. With additional imagery, ad copy, and content curation opportunities, retailers will be able to make a case for their company itself, rather than simply a single product they sell. Not only does the new showcase format alter the value proposition that PLAs represent to retailers, but it also signifies a fundamental shift in the nature of PLA management. The more complex premium offering necessitates a more active and holistic management style, discouraging the automation-heavy strategies that some retailers have chosen to deploy. As a result, the PLA management of tomorrow could come to resemble display and text search management today – requiring a balance of both technical savvy and creative chops. Above all else, showcase ads will most likely translate to a rise in the value of each mobile PLA interaction, which is great news for advertisers looking to increase their mobile presence. The ability to show multiple stock keeping units (SKU) per ad will give retailers a greater chance at piquing the interest of searchers, and the accompanying creative opportunities will allow advertisers to relay promotions and differentiators to help seal the deal. Combined, those factors could lead to not only more orders, but also a greater variety of SKUs being placed into those orders. Additionally, the inherently broader nature of showcase ads could lead to Google showing them in place of text ads on queries previously deemed too general for PLAs, increasing overall mobile PLA volume. With those benefits, however, will also come with new competitive challenges. The large card format of showcase ads will result in fewer ads on the visible SERP, which could foster fierce competition as advertisers fight harder for the limited number of visible showcase placements. In response, bidding markets will likely adjust upward, causing cost per click (CPC) inflation. As always, the only way for retailers to find sustainable profitability will be to remain one step above the competitive curve, finding pockets of opportunity that their competitors haven’t. Showcase ads make the PLA game more complex, and that should be a welcome shift for advertisers. While that complexity won’t come without tradeoffs – most notably increased management time – it also affords retailers willing to master that complexity an extra leg up over those who have tried to reduce PLA management to an algorithm. With PLA investment skyrocketing across the industry, that leg up could eventually mean impactful results for retailers. Will it actually? Let the testing begin.